We ended up having our first look at Throne of Thunder four days later than planned, but during that interval we added a couple more raiders to the guild – we now have 9 in total, which makes our runs official guild runs now! And tonight, we are 1/12 10-man normal mode! We had Worldbreaker’s Stormscythe and Infinitely Conducting Bracers drop. Nothing Thunderforged, but upgrades are upgrades! The trash after Jin’rokh wasn’t quite as bad as expected – mostly because all the horror stories we’ve all heard prior to it made us ridiculously careful. It still took us about half an hour, two wipes and multiple people getting punted off the bridge before we got to Horridon, though. Trash > boss. Blizzard be trollin’. We got in maybe 5 attempts on Horridon, none of them great. The second door is a PAIN; we were getting overwhelmed by all the venom-adds. We did reach the third door once, but with half the raid dead so clearly there’s room for a lot of improvement. Still! 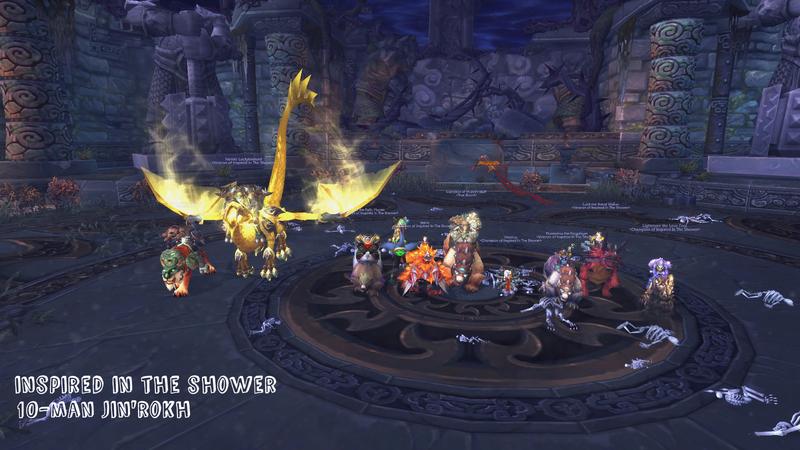 Jin’rokh down, raiding issues (fingers crossed) coming to an end – good times, hurray!